Recently we were invited to a movie premier, our very first one and we are so excited about it. 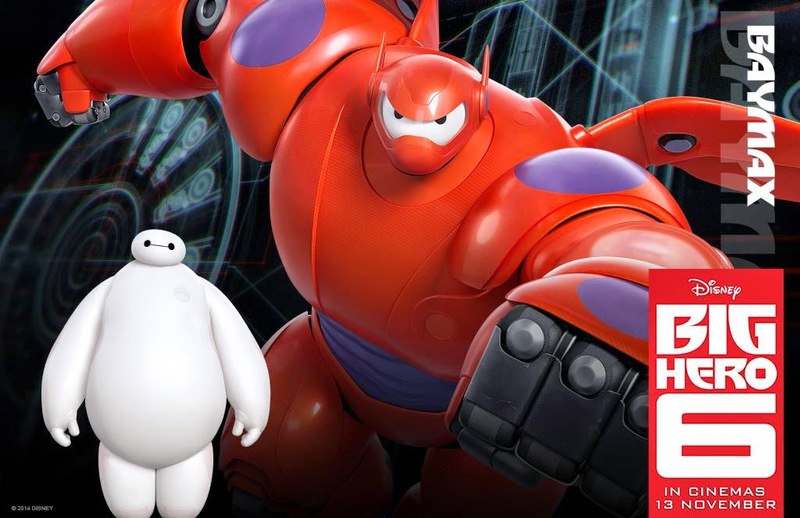 More when its to watch the action packed comedy-adventure movie Big Hero 6. DinoBoy has been bugging me, reminding me almost every day that he wants to watch this movie since the day he saw the trailer in Disney XD. He is whopping up with joy when he knows that he is finally seeing it, way before any of his friends! We were there almost on the dot and it was crowded! Instead of trying out the games, some thing he will not missed for any reason, DinoBoy made a bee line to the cotton candy queue. It was a long slow moving queue, it took longer than I expected that I just have to check out what's holding up the queue at the front of the line. I like this lady mending the cotton candy kiosk already! She was making sure that every cotton candy looks like Baymax! There were toys for everyone to see, feel, touch and play a little bit and then decide "I will get these for so-and-so or myself!" What makes us or rather DinoBoy wants to watch this movie so badly? Well, I think every one will agree with us that it was the 6 feet tall and 75 pounds inflatable Baymax, a healthcare companion. The movie unfolds by introducing Hiro Hamada, a 14 year old boy who not only is a robotics prodigy, but a genius who has graduated in high school and love spending time in back alley robots battle tournament. 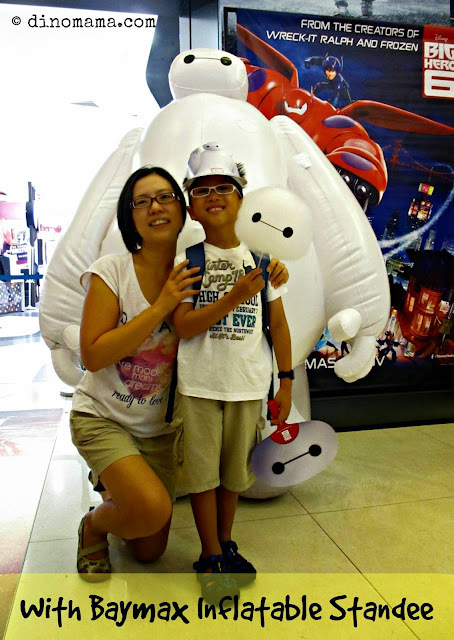 Hiro was introduced to Baymax when Tadashi Hamada; Hiro's older brother dropped by the "nerd school" to pick up some stuffs before sending Hiro to yet another robotic tournament. Baymax was created by Tadashi with the sole purpose of helping others and with a simple scan he can detect vital stats, and given a patient’s level of pain, can treat nearly any ailment. You'll think that once Hiro realized that he just gotta get into the "nerd school", which he will eventually be, he'll get to build some great stuffs and every one lives happily ever after. Well, if that happens then it is not Walt Disney Animation Studio's style, the people inside there will never allow such things to happen. So they added in a twist of fate where Tadashi was killed in a fire, Hiro found out that his latest invention that presumably was destroyed in the fire was stolen by someone. He got all emotionally upset and went all out to find that person who caused the death of his brother. Besides upgrading Baymax with some kung-fu fighting moves, he also helped transformed Tadashi's 4 colleague mates into crime fighting heroes in super hero suits according to the expertise they each are good at, you can meet them here. On a last note, besides loving the action, this Mama is mesmerized by the majestic view of the sky line where Hiro and Bamax sat on top of a very tall tower, relaxing, and flying with them zipping in between buildings and through the cloud. I must say the animations are really superb and Walt Disney Animation Studios have out done themselves once again. Which Baymax do you like? So don't miss Big Hero 6, seriously. Besides having all the famous people working in the movie; directed by Don Hall (“Winnie the Pooh”) and Chris Williams (“Bolt”), and produced by Roy Conli (“Tangled”), it is an adrenaline-pumping action, heartfelt emotion and plenty of humor movie where both young and old will enjoy. And I guarantee you that Baymax will touch your heart and soul, we went awwww~~ whenever we see Baymax on screen and DinoBoy clearly love him too because he said this to me one night before bed time..
"Mummy, I can't go to sleep until you tell me that you are satisfied with my care." ... which I gladly obliged of course. Mark the date; 13 November 2014, which is TOMORROW! Grab your tickets online NAO to avoid disappointment which you will definitely be if you don't listen to this Mama because this is such a great show that EVERY ONE will want to watch. - A Southeast Asia initiative to help spread some love, and we wondered if you could help us to get the ball rolling? - We want to spread the Baymax Hug! - We hope the way Baymax cares for his buddies will inspire people to show support to the people they care about, and what better way than by giving them a #BaymaxHug! 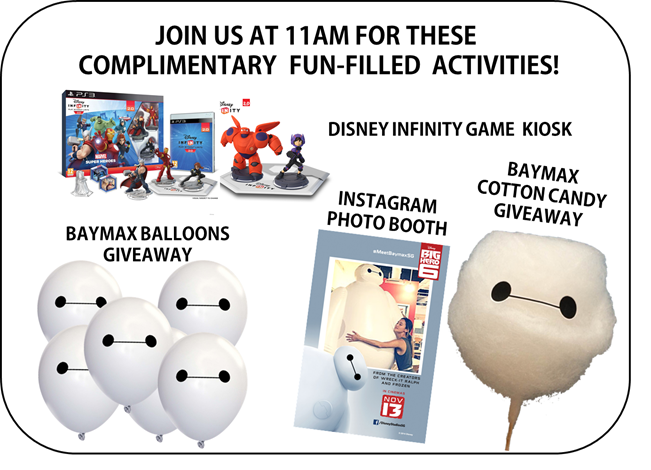 - But don’t forget if you receive the #BaymaxHug, then it is up to you to pass it forward to another buddy, so that the movement continues! - Don’t miss out the Baymax inflatable standee at the exhibition area, for a photo opportunity with the lovable character. 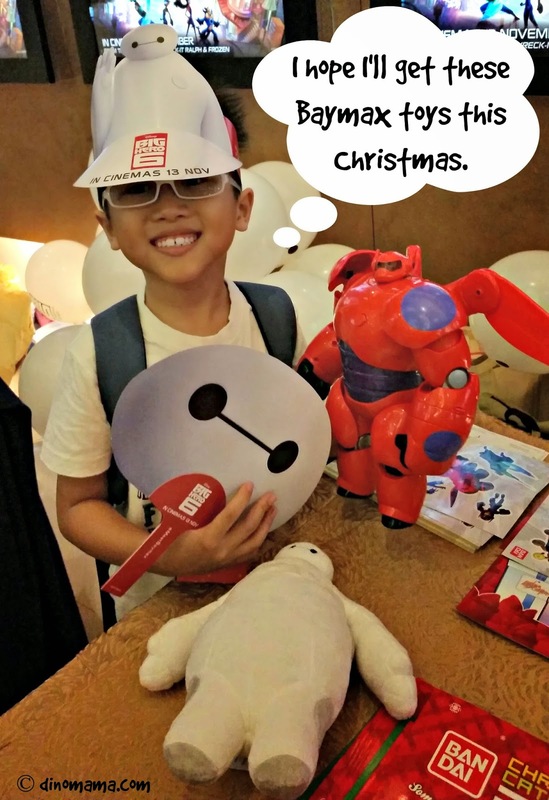 Snap a picture with Baymax, upload the image to your social media accounts (Facebook/ Instagram) using #BaymaxHug and nominate (tag) your friends to spread the hug this festive season! 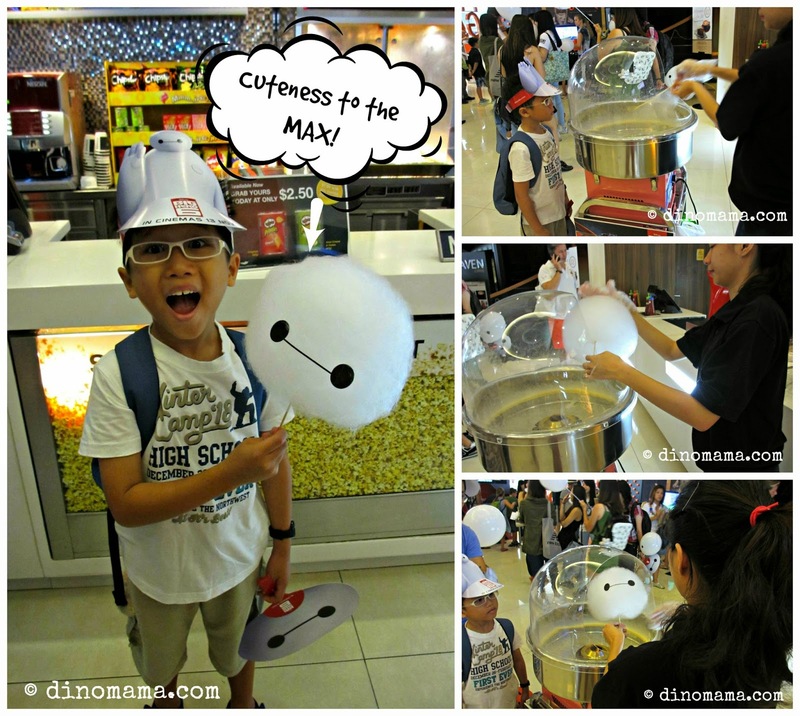 Disclaimer : The DinoFamily was invited by Disney Singapore to attend Big Hero 6 premier. All opinions are based on our review after watching the movie. 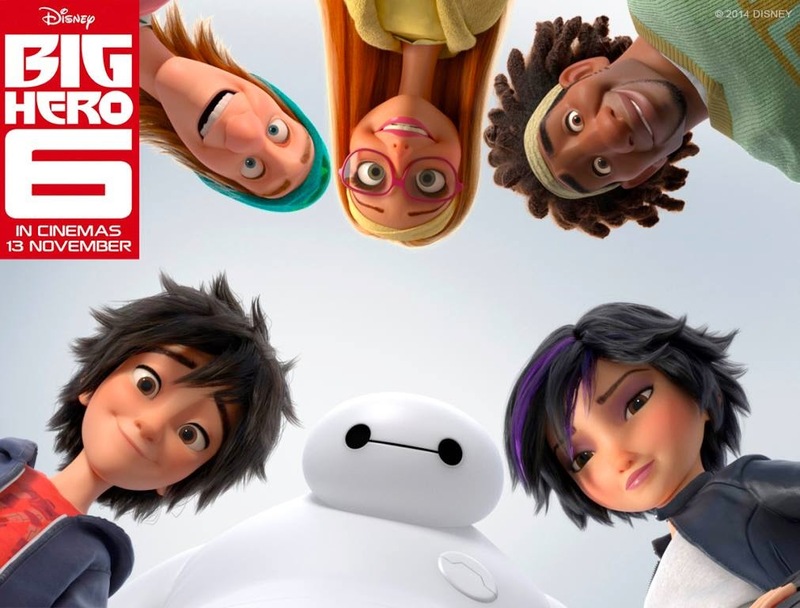 All Big Hero 6 official photos were given to us by Disney Singapore for the purpose of this review. All other photos belongs and are copyright of the DinoFamily.